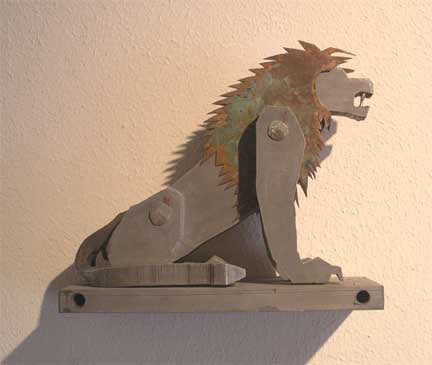 Lions from an exhibition at Goldleaf Gallery, Santa Fe, New Mexico in 2008 with drawings and plans for their construction. The theme Lions At The Gates Of Khorsabad comes from The Lion Hunt from Nineveh at the British museum, attributed to Ashurbanipal the Assyrian king who reigned from 668-627 BC. 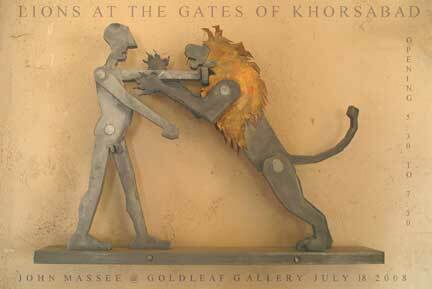 Lions At The Gates Of Khorsabad price list Poster 12"x24"
Like most Sculptures these Lions are experiments. They are made of Aluminum from patterns. I will make more of them. They are not unique. It's possible to order another of any of one of these designs. No two will be exactly alike as they are made by hand. Mine. Panels in the British Museum in three regist carved from gypsum. very low relief. 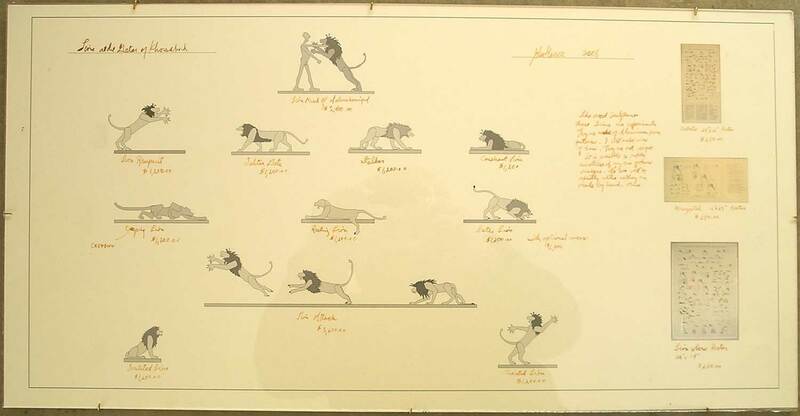 Great skill and imaginative composition in that the distance between lions implies speed.Slow at first then a very quick leap implied by shorter space between midd(l)e and left airborne lion. 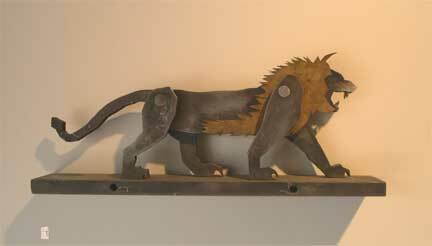 Because of Rules I wasn't permitted to make and mount arrows that in original are piercing middle lion in spine. 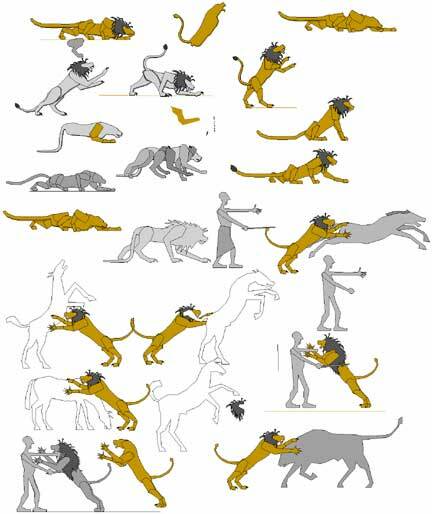 Sequence is from right to left and top to bottom. 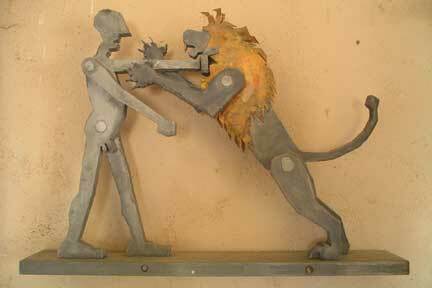 Original has right lion creeping out of a cage opened by a small boy. Airborne lion is speared by a guard behind Ashurbanipal. Ashurbanipal is ready to fire arrow into throat. 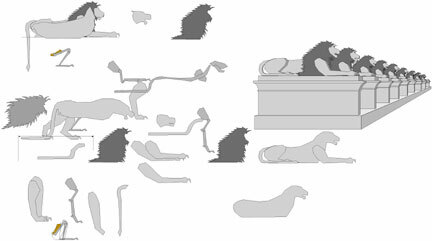 Middle register has arm splayed lion lion (see lower mid right on main poster). Ishtar gate lion (C.), odd stance in that legs are both forward on left side and back on right. 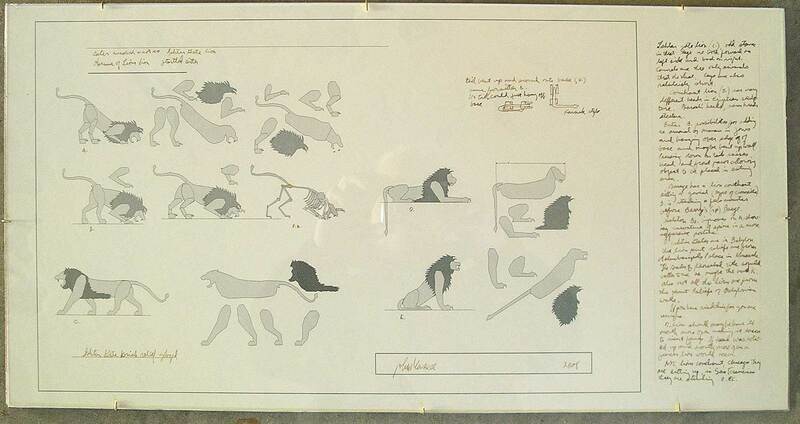 Couchant lion (D.) has many different heads in Egyptian sculpture. Pharoah's head, rams head etcetera. 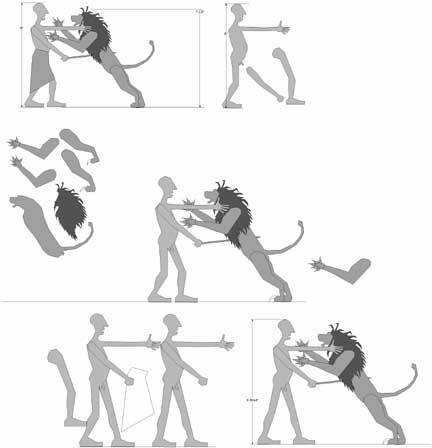 Eater B. possibilities for adding an animal or human in jaws and hanging over edge of of base and maybe bent up wall. 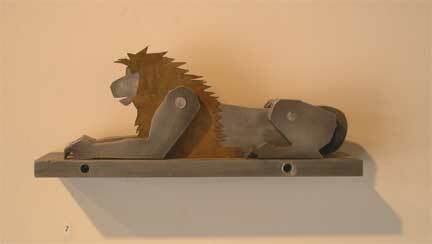 Pressing down on tail raises head and front paws allowing object to be placed in eating area. 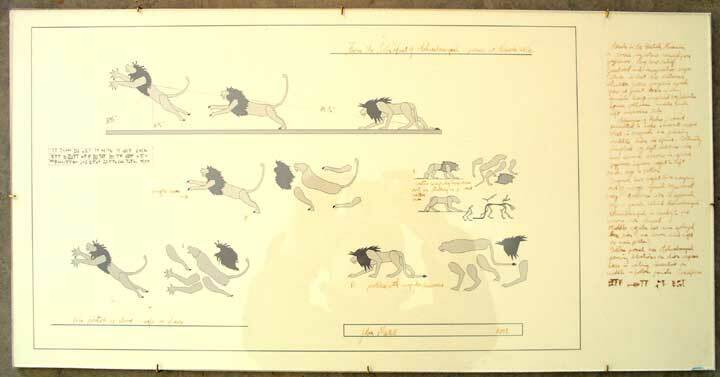 Barrye has a lion couchant killing a gavial (type of crocodile) B. is attacking a few minutes before Barye's (sp) Barye. Skeleton B2 improves on A showing curvature of spine in a more aggressive posture. 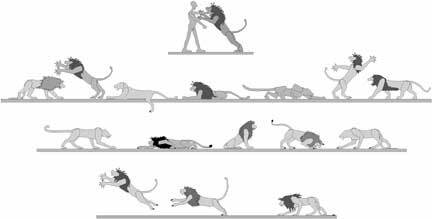 Ishtar gates are in Babylon the lion hunt reliefs are from Ashurbanipals Palace in Nineveh. The Gates Of Khorsabad title sounded better to me as , maybe the hard K. Also not all the lions are from the Hunt reliefs or Babylonian walls. If you have read this far you are unique. 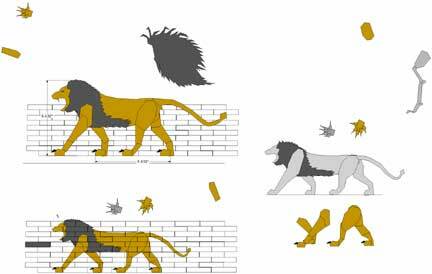 D. lion should maybe have its' mouth more open making it easier to insert fangs. 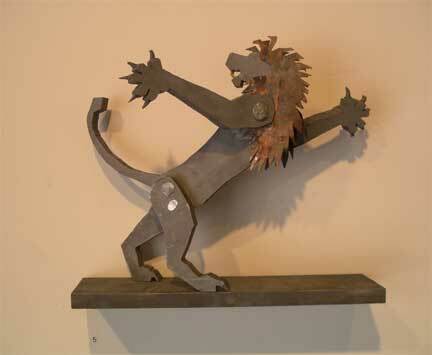 If hand was rotated up and mouth more open a fiercer lion would occur. NYC lions couchant, Chicago they are sittingup, in San Francisco they are standing D. EC.